Batali and Bastianich talk a lot of italian food, how to cook, how to eat but their idea of italian food is more American-Italian. I betrayed my favorite pizzeria to try Otto a popular pizzeria owned by Batali/Bastianich. The advertise says “serving classic Italian pizzas…”, but nothing is true. The pizza’s pasta was like a piece of wood, the tomato was ketchup, and I don’t remember the bufala mozzarella taste because were only few pieces but for sure wasn’t real bufala. Don’t call it Italian pizza when, if americans like this kind of food, no problem for me, but don’t try to sell it as real italian food. Did Eataly find the right partner for the new market store in NY? I’m not sure, we will find out soon. 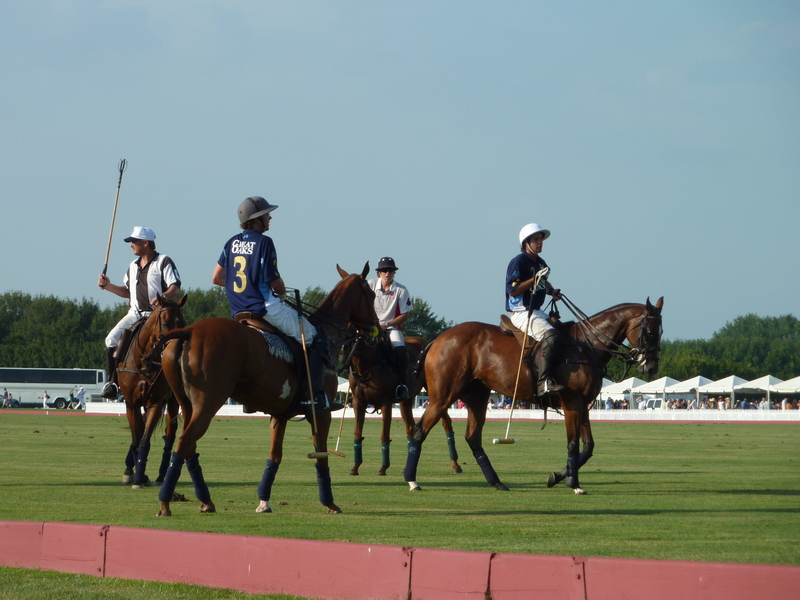 A day with a polo match, Chris Bosh and long island wine. First winery Lieb Family Cellars: 8$ for 4 taste isn’t expensive, but the wine was ordinary and the barman didn’t know anything of the wine but was fun. Bottles are expensive (45$ for a blend and 20$ for a Long Island Chardonnay is crazy). Second winery Pindar Vineyards: 4$ for 5 taste (cheaper), but wine still ordinary and there were hundreds of people (like in a mall) most of them already drunk (1 pm). Do you want to get drunk and have a fun with your friends? You can go; do you want taste wine? Change your destination. Then I went to watch the first match of the Mercedes Polo Challenge, thousand people for this VIP popular summer event to the Hamptons. Picnic, party, drink, famous people and women with the most fancy and trendy dresses are the most important things in this event, no one was interested in the match; only during the half time, spectators wandered all over the field stomping down the torn up turf, a real British tradition. I know burger isn’t real food, isn’t healthy, isn’t mediterranean diet, but I can’t live in manhattan without tasting the only american speciality. RARE (lexington and 37th): the best burger so far and you can choose within several kind of cheese. The basket with 4 kind of french fries is delicious. No line to enter and service is acceptable. SMITH and WOLLENSKY pub (3rd and 49th): the pub of the popular steakhouse has a great food; open till late is maybe too formal and slightly expensive but after the show or match is a perfect solution for your late dinner. PJ CLARK (3rd and 53th): medium quality burger and medium service. Usually the daily’s specialty is better than the burger. JG MELLON (3rd and 72nd): big line (from half to one hour and half), small space (the other tables are 10cm beside you) you can eat an average burger and no more. Price like the others in NYC. SHAKE and SHACK (madison square park): average 45 minutes in line during all day for this popular take away kiosk in the best Manhattan square. Cheap price for a nothing special burger; spending your life in line for junk food is crazy for me, but here seems the most popular sport. MINETTA TAVERN (minetta street): are you crazy? More than 25$ per burger means kidding you; no thanks.